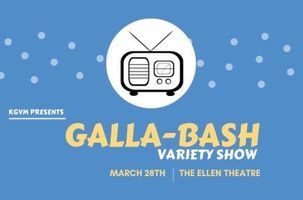 Gallatin Valley Community Radio KGVM invites you to the first ever Gallabash variety show at the beautiful historic Ellen Theatre in Down Town Bozeman! On air since May 2018, KGVM strives to bring educational, informational, thought provoking, creative, and entertaining programming to and from the people of the Gallatin Valley. We are an all volunteer organization, we receive NO corporate or federal funding, and rely solely on the support of the people of the Gallatin Valley! Come support us and your local favorites! Gallabash will be a fun opportunity for you to get a taste for some of the talent and intellect Bozeman, the Gallatin Valley, and KGVM has to offer. The zestful Roerick Sweeney, actor, muscian, and comedian will be our Emcee. Here's our amazing lineup so far! Al Kesselheim- published author and adventurer John Miller- speaker Larry Kiff- KGVM classic country singer and Red Ants Pants 2018 performer Local Funny Folks: Kyle Kulseth, Jenna Eliell, Zachary Martinez, and Thom Blake Michael O'Rielly- Aerial Silks Artist Luis Torres- KGVM DJ for Big Lu’s Latin Experience Chris Cunningham- local musician Peter King and The Dead Yellers- original country rock from Bozeman- "dancin' and cryin' music"